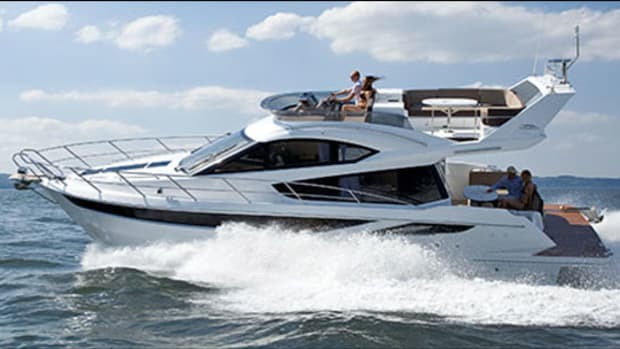 As Sealine puts product in the pipeline to America, we’re watching closely. And with the F48, we like what we see in terms of performance, finish, and quiet ride. 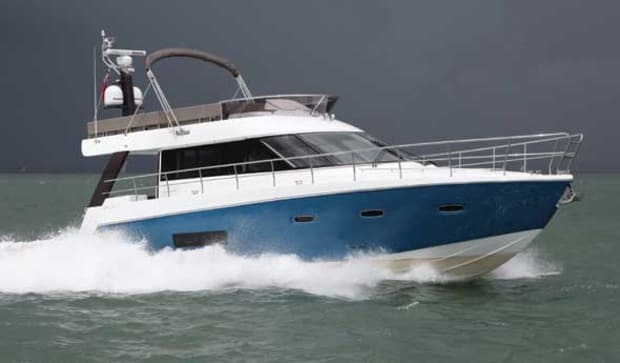 Power & Motoryacht's boat test of the Sealine F48. 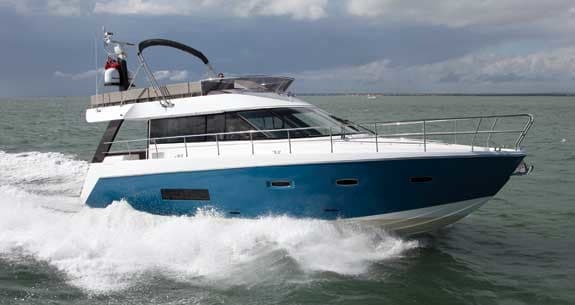 Sealine is getting ready to make a splash in the U.S., and their fun F48 is quietly leading the way. It’s funny how things work out sometimes. Before this past June, there was never a moment in my life when I thought I’d find myself dining on a lunch of Dover sole at the Royal London Yacht Club on England’s Isle of Wight. A steady rain falling from dour skies outside, as fleets of small sailboats and RIBs crisscrossed The Solent, many of them perfecting their roles for the upcoming Olympic Games. It was all a little bit surreal. I’d bet that the good people at Sealine can relate to my feelings of surreality lately, mainly because of a recent opportunity that has presented itself that must seem too good to be true. 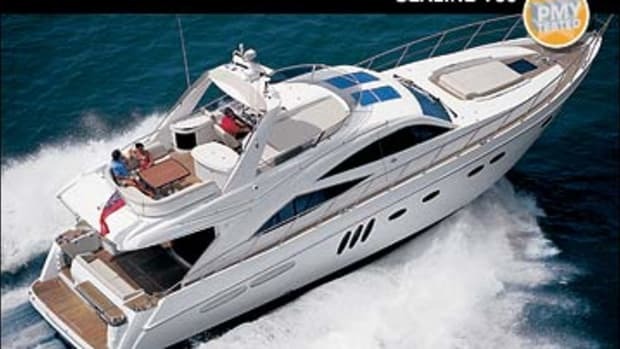 Sealine is a 40-year-old company that has had past success in the states, but for the last ten years, it has been owned by the American conglomerate Brunswick, which forbade the boats to be sold in the U.S. due to concerns of brand cannibalization. 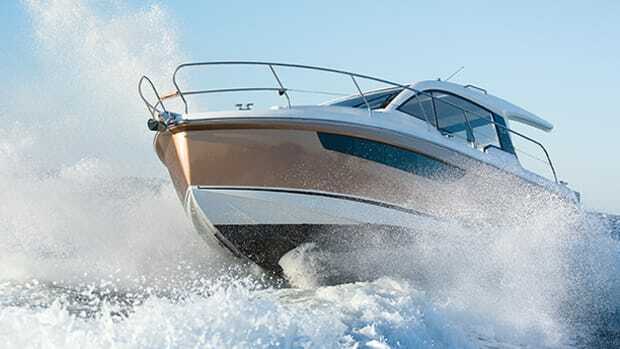 However, a buyout of Sealine by The Oxford Investment Group in 2011 has unfettered the company from in-house concerns, and opened up the ripening (and huge) American market. 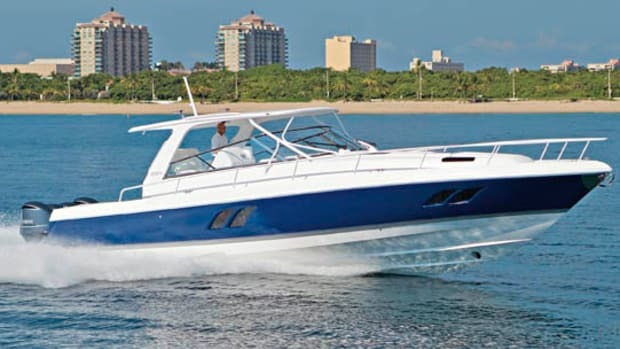 The company now has an outpost in Fort Lauderdale, and is seeking out experienced dealers to sling Sealines from Miami to Seattle and back again. As such, the yard is in full swing turning out new models decked out with typically American accouterments, including leather and mahogany interior accents, onboard washer/dryers, and of course, large fridges for all that ice-cold beer the Brits abhor. 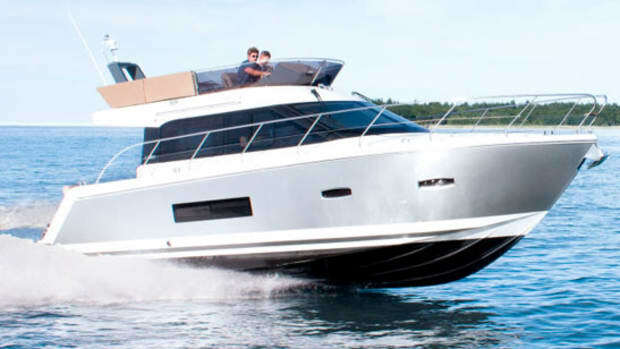 At the vanguard of this effort is the F48, a flying-bridge cruiser that has more than a few strong points that should make her very palatable to any boater, American or not. One of the most impressive things about the F48 was her performance. On many flying-bridge cruisers performance can sometimes be an afterthought. Not so in this case. The F48 has the same hull form as her sistership, Sealine’s sporty C48, and thus enjoys similar, though not identical, performance. She is undeniably nimble, and spun through circles at 20 knots in just a boat length and a half. I doubly appreciated this agility since the channel at that point was littered with other boats, and though we didn’t come close to any, it was heartening to know we could have dodged one at the last moment if need be. That nimbleness can largely be attributed to how dialed in the F48’s Zeus pod-drive system was. Those pods on my test boat were matched to twin 480-horsepower Cummins QSB 5.9 diesels that propelled us across the white caps and past a seaside castle at a respectable 28.6 knots. 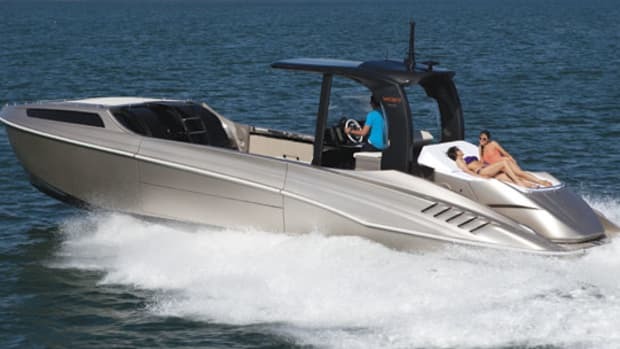 A setup with twin 600-horsepower engines that Sealine says can hit 32 knots is also available. The boat felt particularly solid and well built cutting across the not-so-glassy seas, and handled the many wakes thrown off by the bogies surrounding us with a feathery entry absent any noticeable jounce. That solidity contributed to another highlight—her noise levels at the lower helm. Compared to similar boats I’ve tested that have easily breached the 80 decibel mark at WOT, she was remarkably quiet in her upper RPM ranges, producing only 77 decibels at full speed. Customization was another key theme of the F48. 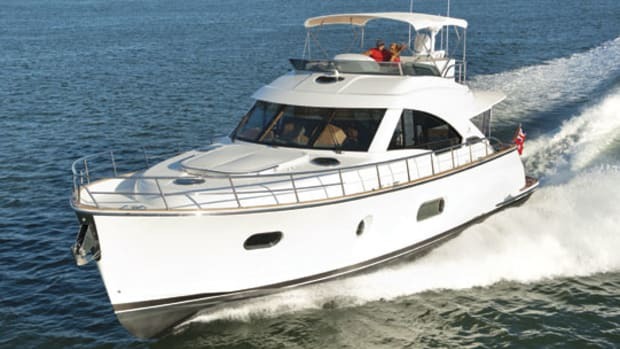 The company offers owners some major choices on all three main decks. That’s not something you see every day on production boats of this size and class. Below, owners have a choice of a two- or three-stateroom setup. My test boat had just the two cabins. The spacious master is amidships and features excellent stowage in the form of a good-sized locker in the aft bulkhead and a gaggle of soft-shut cabinets. The cabin is afforded a touch of elegance by an array of both solid and veneered mahogany throughout, with a gorgeous holly inlay on the cabinets for contrast. My only beef with the space was headroom, which felt a little tight for my six feet. While sitting on the bed, I had to stoop my neck, a trait that I found odd for a boat this size. The master is of course en suite, and the head features a teak sole, as well as a roomy shower equipped with both a rainmaker and handheld fixture. That’s a nice option for anyone who would like to take a shower without getting their hair wet. A forepeak stateroom sported excellent headroom as well as natural light. A thoughtful detail was the air-conditioning controls placed to port, at the head of the queen-size berth. No need to rustle around the room in the dark if it gets hot at night. Just roll over, tweak the dials and slip back to dreamland. In between the master and VIP there is space enough for that customization I mentioned to come into play. To starboard, an area can be designated as a third stateroom, an office, or a dinette area (as it was on my boat). I thought that last layout was probably the best as it essentially turns the accommodations deck into another entertainment space, considering the dinette is open to the portside galley. The theme of customization continues through the well-lit saloon, which boasts breathtaking views due to nearly 360 degrees of windows, broken up only by an aft port bulkhead. 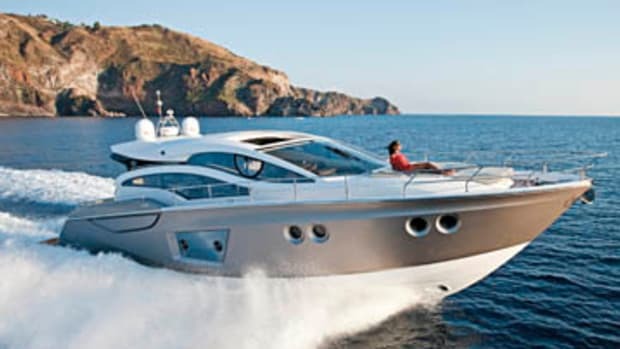 To port, owners have a choice between either a dinette or two forward-facing seats[not pictured].The latter option gives the saloon four forward-facing seats total, another relative rarity on a boat this size. Topside on her expansive flying bridge the F48 features one last point of customization, the choice between a wet bar or a sunpad aft. The outdoor helm, where I conducted all my tests save for the decibel readings, had superb sightlines, which, when coupled with the Zeus joystick, made it an excellent place from which to manage slow-speed maneuvers. One last attribute I’d point out about the F48 is an important, if often overlooked one. The boat felt remarkably safe. Sharp edges were rare and there were handholds all over the place. The side decks were extra wide, and the bowrails were some of the highest and sturdiest I’ve seen on a boat of this class. Safety measures in the world of slick motoryachts can sometimes fall by the wayside, trumped by aesthetic or economic concerns—but not for Sealine. On its boats those details matter. And I suspect that to this company, they’re not even really details at all. A mere 24 hours after I tested the F48, I was back in the U.S. and having lunch again—this time in a less genteel setting—a Hooters in Queens (long story). After a whirlwind tour the boat test almost felt like a dream. 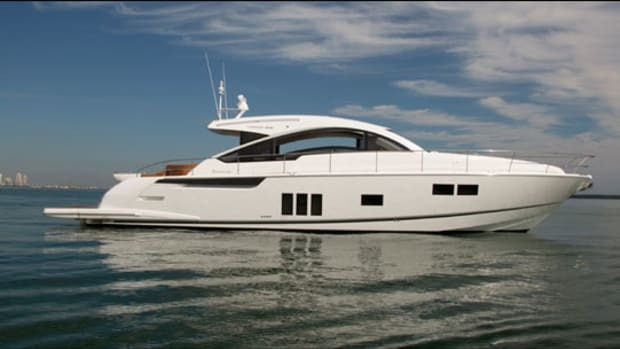 However with the quality yachts that Sealine is producing, as well as their fervency for the American market, I suspect we’ll soon be seeing plenty of Sealines stateside, turning that dream into something undeniably real. 300 gal. fuel, 100 gal. water, 4 persons, 100 lb. gear.